Hortus Camdenensis | Iris pseudacorus L.
Fully-hardy, vigorous, beardless iris with branched stems bearing 4-12 yellow flowers with brown or violet markings. To 1.5m. [RHSE, Hortus]. A useful water-margin plant. 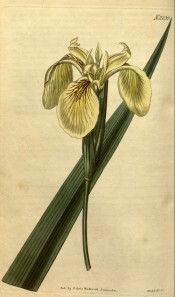 ‘There does not seem to be sufficient difference between this plant [Iris pseudacorus pallida flava, the Pale Yellow Water Iris] and our common Iris Pseud-Acorus to constitute a distinct species, yet there is somethig that pervades the whole aspect not quite agreeing with our native species; nor does it require so wet a soil. Is said to have been imported from Carolina by the late Mr. Lyons; yet we do not find it recorded as an American species.’ [BM t.2239/1821]. Hortus, however, records it from eastern North America. Listed in all published catalogues [B.251/1843].